A family owned and operated business located on Main St. in Newfoundland, Pennsylvania. Here at FDR, we employ the finest Wreckmaster Certified Operators, capable of handling all of your towing and roadside assistance needs. 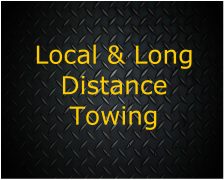 Whether you have a flat tire, A dead battery, Locked your keys in the car, Need a tow, Or if your vehicle is stuck somewhere. WE CAN HELP!